Our theme this month is Homelands. Here, cultural ecologist Dr. David Abram reflects on the deep intelligence that lies at the heart of other living things’ migration patterns. In the summer of 1988, I found myself kayaking in the Prince William Sound of Alaska, a few months before the undulating surface of that life-filled sea was generously layered with a glistening blanket of oil by the Exxon Corporation. A suburban kid from Long Island, this was my first time in the far north, and I was stunned by the colossal scale of the place—by immense glaciers calving off icebergs into the waters around me, by the preponderance of eagles who seemed to glare down at me from every overhanging branch and snag. I had beached my kayak on one of the larger islands for the night, and after a simple meal, I went off walking along the coast as the sun was slipping down toward the horizon, drinking the salt air and listening to the lapping of the small waves and the wind in the needles. After some time I came to the edge of a surging stream about twelve feet across, rippling and splashing in the fading light; and without paying much attention, I sat down on a moss-covered rock a ways back from the stream’s edge just to bask in the rushing speech of those waters, and to gaze out into the oncoming night. And I lost myself in some reverie or other, until my awareness was brought back to the place by a pale glow spreading into the sky from the rocks on the far side of the stream. The glow got steadily more intense until, as I watched, the full moon was hatched from those rocks, huge and round as a ripe peach, pouring its radiance across the stony beach and the gleaming waves and the rustling spruce needles and generally casting a kind of spell over the whole place. Now, I have never, of course, seen a cow jump over the moon. But that night I did see a fish jump over the moon. A great streamlined silhouette, its tail flapping, arced right over the full moon and then tumbled, splashing, back into the water. Whaa?!? I couldn’t believe what I’d just seen and so was still staring at the after-image—when another silhouette leapt right over the moon! I got up and walked over to the water’s edge: the stream, I now saw, was thick with salmon, boiling with salmon, all jostling and surging against the current in fits and starts—it was as if the stream was made of salmon! I gazed and gazed for a couple of hours, then went back to my tent and tried to sleep, but couldn’t. So I walked back in the middle of the night and stood staring into that moon-illumined river of fish, and then I waded out into the middle of that mass of sparkling, silvery muscles, all surging and lunging against the current. In the middle of the stream, I was up to my knees in salmon, but they didn’t care—didn’t even notice; they bumped into my legs and then plunged on past with a single-minded determination I’d never encountered before, nosing aside their dead or dying cousins as they floated back downstream on their sides with their mottled red skin beginning to peel off. But these earnest salmon around me just nudged them aside, hardly noticing, intent on one thing and one thing alone—getting upstream to their spawning place, depositing their eggs and fertilizing those eggs, before they too began to fall apart and to die. I’d never imagined such intensity, such single-mindedness: their total focus on getting upstream to create new life, and their utter obliviousness to everything else—to their dead or dying relatives, to other species who might prey upon them (to me, for instance, my own legs shivering among them), to everything other than the impulse to procreate . . . I’d never before encountered such a collective, visceral imperative. When I returned to the splashing stream the next morning, an earlier high tide had erased my nighttime footprints from the sandy stream bank. The waters, however, had not erased the massive, clawed prints of a large grizzly. Several half-eaten salmon carcasses were lying about on the rocks. I tracked the bear up into the spruce forest and part way around a boggy meadow; then my jitters got the better of me and I hiked back to my camp. PACIFIC SALMON ARE anadromous (or “up running”) fish; born in freshwater streams, they migrate out into the open ocean to mature, then return to those same inland streams to spawn and die. Each of the major species—pink and coho, chinook and chum and sockeye—has its own cyclical rhythm for this oscillation between fresh and salt water. Chinook salmon, for example, spend a year in fresh water and up to five years in the open ocean before making the return journey upriver; pink salmon, after only a few months in fresh water, spend a single winter at sea; chum salmon take two to five years in the salt of the open ocean, while coho salmon return inland after one and a half or two years. The migratory rhythms of sockeye salmon are the most diverse of the bunch. They spend from three months to three years in fresh water, and from one to four years in the ocean brine. The diversity and differentiation of the sockeye cycles results from the great variety of their freshwater habitats—the different lengths and sizes of their rivers and streams. In fact, any wild Pacific salmon belongs not just to one of those five major Pacific species but also to one of hundreds of subgroups, a race or “run” unique to its natal river or tributary stream. Each race is marked by particular qualities coevolved with that stream, corporeal traits exquisitely tuned to the characteristics of that watershed: to the melting glaciers on the mountains above and the steep or gradual grade of a stream’s incline, to the coarse or fine grain of its sediments and the specific chemistry of its waters (itself informed by the geology through which those waters percolate, by the gnarled roots that jut into those waters and the specific leaves that fall upon their surface), to the patterns of shade afforded by the surrounding forest and the various predators (river otters, eagles, bear) of that valley. Each race of salmon is thus the rhythmic pulse of a particular place, each individual an ocean-going avatar of a specific stream or inland lake. THE BOSQUE DEL APACHE National Wildlife Refuge is a sparsely wooded flood plain along the Rio Grande, at the northern edge of the Chihuahuan Desert. By this strip of moist bottomland, a band of Piro Pueblo Indians built their pueblos some seven centuries ago; they hunted here, and gathered wild fruit, and raised turkeys until Apache raids and European diseases forced them to abandon these fertile soils. Later the Apaches themselves came to camp among the willow stands and the cottonwoods. In recent times the river has dwindled, its waters drawn for use by industries further north—yet now and then it still floods these riparian fields, enabling local farmers to grow alfalfa and corn in the desert silence. Acequias, or irrigation ditches, run alongside the fields. These are used by the locals to manage the water levels on behalf not only of their crops but of the many wild, migratory birds that gather in this narrow place of moisture every winter, a seasonal convergence much older than even the earliest human inhabitants. Each winter, sandhill cranes gather here in enormous sociable crowds, roosting and feeding in the stubbled fields (a few adults standing extra tall, their necks extended to keep watch for the whole flock). Yet in the summer, those same cranes are fiercely asocial in their breeding grounds a thousand miles north. There, each mated pair (sandhill cranes mate for life) defends an expansive territory just for themselves and one or two newly hatched colts, whom they steadily feed insects, seeds, and small rodents. Nonetheless, as the cold of early autumn begins to clamp down on the insects in those northern mountains, each crane family begins feeding and roosting with other nearby families. The young cranes make more and more practice flights, provoked by other scattered groups whose coarse bugling they hear gliding far overhead, until, unable to resist, they and their parents take to the sky, rising and rejoining other families in strands that gradually gather into great, spiraling hordes, fractaled dragons made of hundreds of long-necked and exuberant voices, soaring and flapping toward the south. How does it feel to add oneself, after a summer’s solitude, to this slowly gathering sky-torrent? By what landmarks do these aggregate dragons navigate? How does this flood of wings find its way every autumn, year after year since time immemorial, to this tiny oasis of moist bottomland in the vastness of the New Mexico desert? Other sandhill collectives spend these cool months far to the east and the south, in Texas and northern Mexico. Come late winter, waves of fidgety restlessness will spread through their communal roosts, and the young males in those flocks will find themselves leaping more concertedly into the air, the moment ripening within them and their fellow leapers until they all ascend in whirling commotion, making their way toward their remembered staging ground along a small stretch of the Platte River, in Nebraska. Here they’ll convene for a few weeks with half a million of their tribe—four-fifths of the world’s sandhill cranes—feeding and fattening themselves in the cornfields, strengthening themselves for the longer part of the journey. Then this broad, feathered blanket of birds will flap skyward and begin to unravel into billowing scraps and then scattered threads, as families separate out from the fabric and fly toward their respective breeding grounds in Saskatchewan and Alaska and Siberia, each bonded pair with its one or two offspring, following the remembered route toward the individual nesting site in the boggy tundra where they’d nested last year, and the year before, and the year before that . . .
What is this allurement, this seasonal memory that rises in the muscles, calling one skyward, drawing one back and back again to the place of one’s begetting, to that precise blend of wind and rock and glistening water? The irresistible draw of the bustling and clamorous crowd now giving way, as it always has, to the imperatives of solitude and intimacy and home. After the most recent ice age, nomadic bands of humans, too, made their way up into the coastal forests and the river valleys, drawing sustenance from the seasonal storms of large fish that would periodically undulate up the rivers, surging past fallen trunks and leaping up waterfalls. Centuries later, while developing ways of preserving the caught salmon (drying them in the winds or smoking them on wooden racks), some native peoples settled in permanent villages along those rivers. 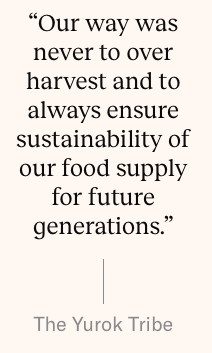 Through trial and calamitous error—at times overfishing the runs and having to endure the consequent seasons of famine—these cultures gradually learned how best to harvest the collective gift without interrupting its cyclical replenishment. 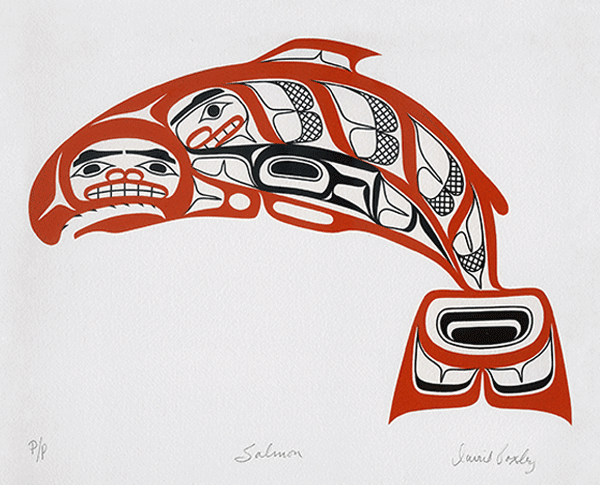 Central to all such cultural constraints throughout the Pacific Rim was a recognition of the salmon as a powerful emissary from hidden or unseen dimensions—a form of energetic intelligence that came toward humankind from the sacred heart of the mysterious. 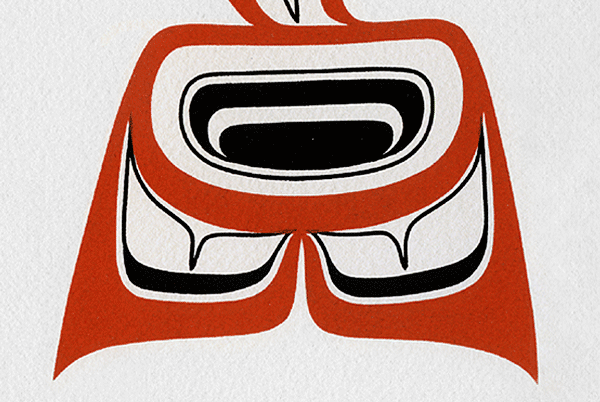 Indigenous cultures from every part of the North Pacific Rim revered the salmon as an uncommonly holy power, ritualizing their respect in ceremonies that honored the first salmon caught in the spring. No other salmon could be taken during these rites, wherein the first salmon was treated as an esteemed guest before being carefully prepared and ingested. Across the Pacific, among the Ainu people of northern Japan, whenever any family caught the season’s first salmon from the river, the fish was passed through a special window into their house before being placed in front of the hearth fire. There the family would address the spirit of the salmon directly, honoring it ceremonially with spoken words and ritual gestures. The household fire, for the Ainu, was herself a goddess who could see all that unfolded around her; she would report back to the other gods that the salmon had been treated with proper respect. MORE DETACHED AND TECHNOLOGICAL approaches to tracking salmon have yielded other ways of describing their whereabouts once they depart the inland waters. Upon leaving their rivers, the salmon spread out, spending the largest part of their lives swimming in colossal circles throughout the North Pacific. Their journeys carry them to the remotest regions of the sea, feeding and growing large on the ocean’s abundance—on herring and smelt and other small fish—traveling distances that boggle the human mind. After several years dispersing to all points on the horizon, following their food whence it leads them, the members of a single run unerringly return to the mouth of their natal stream—all converging there, somehow, at precisely the same time. How they pull off this feat remains an enigma for present-day science. Once the salmon come close to their home stream, it’s probable that they rely on their astonishingly keen sense of smell to distinguish between the subtly different waters of neighboring tributaries. But how the fish navigate across thousands of miles of ever-shifting and largely featureless ocean to make their way back to the very same coastal point from whence they set out years earlier remains an elemental mystery to us, confounding our primate senses and our terrestrial, pedestrian logic. AS ENIGMATIC AS THE CYCLIC dispersal and convergence of the salmon, as uncanny as the invisible allurement that draws half a million sandhill cranes across the body of a continent—and more so—is the well-nigh impossiblemigration of monarch butterflies. Unlike other butterflies, many monarchs undertake a long annual odyssey superficially similar to that of the cranes. But with a key difference: the butterflies’ cyclical migration unfolds only over the course of multiple generations. The northernmost generation of monarchs, those who emerge from their chrysalis stage in northeastern North America to feed on the nectar of milkweed and goldenrod and clover, launch each autumn on a mass southward migration covering as many as 4,830 miles to reach their overwintering sites on great conifer trees in the mountains of south-central Mexico. Filigreed with black, their gold wings flutter and dip across yards and fields, beguiling us with bright hues that signal their toxicity to potential predators. When they arrive on the transvolcanic plateau of Mexico, they’ll cluster in immense numbers on the branches and trunks of the oyamel fir trees, their metabolism slowing down as a quiescence settles over the flocks. Those that survive the winter hibernation will rouse themselves in late February to mate and begin the long migration north. But they’ll fly only as far as they need to reach the first stands of milkweed in the southernmost states. They will lay their eggs on those milkweeds and shortly die. The caterpillars that hatch from those eggs a few days later will feed on the milkweed for a couple weeks before transforming themselves into pupae. When butterflies emerge from those chrysalises, they’ll continue the journey north for several weeks until the females, once again, lay their eggs on stands of milkweed and pass away. Only the third generation born of that northward migration will reach its ancestral destination before laying its eggs. And the subsequent generation—the one born in that northernmost homeland—will not die after four or five weeks, like its parents and grandparents and great-grandparents. The butterflies of this special generation will live seven or eight months; it’s they who undertake the whole southward migration, traveling upwards of fifty or sixty miles a day. Four generations removed from those who last journeyed south, they will wing their way over mountains and spreading suburbs and dammed-up rivers, roosting in maples and pines, only to push south afresh the next morning, ultimately zeroing in on the very same few acres of conifers in the Mexican highlands—perhaps even the very same tree—to cluster with a hundred million other monarchs through the winter. If they survive, it is they who’ll mate when the weather begins to warm and begin again the spring migration back north. Unlike cranes and other migrating birds, then, these butterflies cannot possibly rely on the remembered landscape for navigation; the monarchs flapping their way south and finally converging on those precise trees are the great-great-grandchildren of those who made the same journey last year! By what magic do these delicate insects find their way? How does an organism inherit such intricate instructions—precise navigational guidance that must be different for each successive generation? We do not know. Recent research suggests that the monarchs may orient themselves by the position of the sun, using their body’s circadian rhythm (their so-called “internal clock”) to vary the angle at which they orient themselves throughout the day. Still, a monarch flapping southward through Georgia would need to “interpret” the angle very differently from a migrant passing at the same latitude through Mississippi or Texas. When high winds or storms blow the butterflies far off course, how do they recalibrate their orientation? During the spring migration, even along a single route north, a butterfly from the first generation would need to orient by the sun very differently from a butterfly of the second or third spring generation. We have no clue as to how any creature could pull off such a thing, much less such a diminutive insect. By what magic do these delicate insects find their way? How does an organism inherit such intricate instructions—precise navigational guidance that must be different for each successive generation? We do not know. LIKE SPRING MONARCHS fluttering north toward specific clumps of milkweed that only their distant descendants will reach, the migrating salmon and the sandhill cranes appear to avail themselves of somatic skills far beyond our bodily ken. The only way contemporary science seems able to fathom their uncanny navigational powers is by likening the abilities of these animals to technologies of our own, human invention. We are told, over and again, that these migratory creatures make use of internal maps and inborn compasses, of innate calendars and internal clocks. Clocks, compasses, and calendars, however, are by definition externalcontrivances, ingeniously built tools that we deploy at will. Metaphorically attributing such instrumentation to other animals has perplexing implications, suggesting a curious doubleness in the other creature—a separated sentience or self that regularly steps back, within its body or brain, to consult the map or the calendar. It seems unlikely, however, that organisms interact with an internal representation of the land in any manner resembling our own engagement with maps. Cranes and butterflies would have little use for a separated re-presentation of the Earth’s surface, for they have never torn themselves out of the encompassing presence of the wide Earth. Our reliance upon such instrumental metaphors seems to stem from our civilized assumption of a neat distinction between living organisms and the nonliving terrain that they inhabit, an unambiguous divide between animate life and the ostensibly inanimate planet on which life happens to locate itself. As long as the material ground is considered inert—as long as the elemental atmosphere or ocean is viewed as a passive substrate—then the long-range migrations of other animals can only be a conundrum, a puzzle we’ll strive to solve by continually compounding various internal technologies that might somehow, in combination, grant a particular creature the power to grapple its way across the world. Instead of hypothesizing more metaphorical gadgets, adding further accessories to a crane’s or a salmon’s interior array of tools, what if we were to allow that the animal’s migratory skill arises from a felt rapport between its body and the breathing Earth? That a crane’s two-thousand-mile journey across the span of a continent is propelled by the felt unison between its flexing muscles and the sensitive Flesh of this planet (this huge curved expanse, roiling with air currents and rippling with electromagnetic pulses), and so is enacted as much by Earth’s vitality as by the bird that flies within it? Such a conception need not contradict any of the accepted evidence gathered from a century’s research into the enigmas of animal migration; it simply offers a new way of interpreting and integrating those various discoveries. By focusing our questions so intently on the organism, as if it carries all the secrets of this magic hidden within itself, we easily lose sight of the obvious collaboration that’s at play. By adding new gadgets to an animal’s neurological and genetic endowment, we tacitly induce ourselves to focus upon relationships interior to the organism (how, for example, does the animal bring its biological clock and its internal map to bear on its compass readings), deflecting our curiosity and attention from the more mysterious relationship that calls such interactions into being. What is this dynamic alliance between an animal and the animate orb that gives it breath? What seasonal tensions and relaxations in the atmosphere, what subtle torsions in the geosphere, help to draw half a million cranes so precisely across the continent? What rolling sequence or succession of blossomings helps summon these millions of butterflies across the belly of the land? What alterations in the olfactory medium, what bursts of solar exuberance through the magnetosphere, what attractions and repulsions . . . ? For surely, really and truly, these migratory creatures are not taking readings from technical instruments nor mathematically calculating angles; they are riding waves of sensation, responding attentively to allurements and gestures in the topographical manifold, reverberating subtle expressions that reach them from afar. These beings are dancing not with themselves but with the animate rondure of the Earth, their wider Flesh. Consider the deep somatic attunement by which a salmon feels its way between faint electromagnetic anomalies, riding a particular angle of sun as it filters down through the rippled surface, gliding with certain currents and plunging up against others, dreaming its way through gradients of scent and taste toward a particular bend of gravel and streamside shadow. Whatever specialized sensitivities and internal organs are brought to bear, those very organs have coevolved with textured patterns and pulses actively propagating through the elemental medium; indeed, those sensitivities have often been provoked by large-scale repetitive or rhythmic happenings proper to that part of the biosphere—by pulsed coalescences and cyclic dispersals—and so can hardly be fathomed without reference to these patterned gestures within the body of the planet. Perhaps it would be useful, now and then, to consider the large, collective migrations of various creatures as active expressions of the Earth itself. To consider them as slow gestures of a living geology, improvisational experiments that gradually stabilized into habits now necessary to the ongoing metabolism of the sphere. For truly: Are not these cyclical pilgrimages—these huge, creaturely hejiras—also pulsations within the broad body of Earth? Are they not ways that divergent places or ecosystems communicate with one another, trading vital qualities essential to their continued flourishing? Think again of the salmon, this gift born of the rocky gravels and melting glaciers, nurtured by colossal cedars and by tumbled trunks decked with moss, fungi, and ferns—an aquatic, muscled energy strengthening itself in the forested mountains until it’s ready to be released into the broad ocean. Pouring seaward, it adds itself to that voluminous cauldron of currents spiraling in huge gyres, shaded by algal blooms and charged by faint glissandos of whalesong. . . . Until, grown large with the sea’s abundance, this ocean-infused life flows back up the rivers and tributaries and spreads out into the wooded valleys, gifting the hollows and the needled highlands with new minerals and nutrients, feeding bears and osprey and eagles, ensuring that the glinting gift will be reborn afresh from a lump of luminous eggs stashed beneath a layer of pebbles. This circulation, this systole and diastole, is one of the surest signs that this Earth is alive—a rhythmic pulse of silvery, glacier-fed brilliance pouring through various arteries into the wide body of the ocean, circulating and growing there, only to return by various veins to the beating heart of the forest, gravid with new life. Or . . . perhaps it’s better to think of this seasonal reciprocity as a kind of breathing, as an exhalation of millions of young salmon smolts down from the tree-thick mountains and meadows and then out into that roiling cosmos of currents and tidal flows, to mingle with zooplankton and seals and squids; and then the great in-breath, the drawing in of living nourishment from the sea into river mouths and estuaries, inhaling the salmon up the rivers into streams, and from there into the branching becks, rills, and runnels that filter into the green forests, the living lungs of this biosphere. Or is it the broad-bellied ocean that is breathing, sucking these finned nutrients down from the shaded slopes, luring them over rocks and through rapids and hydroelectric dam spillways—drawing them past bustling cities and factories, through intersecting gradients of toxic effluents that sting their mouths and strafe their exposed membranes—on out into the heaving whirl of the sea’s innards, circulating this glimmering nourishment within itself before exhaling it back, a long sighing breath, up into the wooded valleys? However else we may view them, these deterritorializations and reterritorializations—these large migrations of various species—are a primary way that the biosphere cleanses and flexes its various organs, replenishing itself, each region drawing insight from the others, concentrating and transforming such qualities before releasing them abroad, divergent places trading perspectives along with nutrients and nucleotides, the whole half-shadowed sphere steadily experimenting, improvising, slowly altering its display to the blazing fire watching from afar, as the reflective moon rolls on ’round. MIGHT NOT HUMANS, too, recognize ourselves as expressions of the animate Earth? Are we not fluctuations within the broad body of the biosphere? Can we not feel many of our collective behaviors as dynamic gestures proper to the planet itself? Perhaps. Yet this shift of perspective is, in our case, much more difficult to accomplish. After all, much of the hustle and bustle of contemporary civilization seems entirely contrary to the continued flourishing of the biosphere. This roiling tumult of humans hurtling every which way across the land, and the accompanying frenzy of cutting, clearing, damming, paving, and building, is tough to reconcile with the wider, more-than-human commonwealth, especially when so many other species choke on the byproducts of all this human “development”—their flocks dwindling, their movements stymied, their communities crowded out by our unending profligacy. Our own weedy, invasive species had been gradually growing in size for many long millennia, yet we became a full-blown eruption once we began burning gargantuan amounts of fossil fuel. In little more than a century, we’ve expended vast reserves of stored sunlight that had been laid down and concentrated, deep in Earth’s crust, over hundreds of millions of years. The extravagant swelling of our numbers and the crazed speed at which we two-leggeds are conducting our lives—the headlong chaos of our manifold trajectories, along with our rapidly dwindling attention spans—is tightly bound to this conflagration of stored sunlight. Modern humankind would seem to be on a kind of drunken binge, unable to moderate our craving for this instant and overwhelming power, careening this way and that, smashing the fixtures and trashing the house. More broadly, we could say that the steady injection of cheap oil into our veins seems to have induced a prolonged spawn within our species, an unending expansion of our population without regard for what surrounds us. I can’t help but think of the spawning salmon so oblivious to my presence among them as they bumped into my naked knees and plunged on past, nosing aside even their dead or dying peers drifting back down as they single-mindedly surged upstream. However, unlike the cyclical replenishment of the salmon—whose seasonal pulse nourishes countless other animals and plants—our species seems locked in a spawn that never ends. Our inability to notice the other creatures among us, our readiness to shove aside the many of our own kind who are ailing or dying as a result of our recklessness, seems never to abate. Are we the biosphere’s way of exhausting itself, of bringing on a morbid fever, vomiting precious stores of vitality up into the thickening atmosphere? Like the olfactory sensitivity of salmon, like the keen eyes and ears of cranes, our human senses have coevolved with the enfolding Earth, and hence are dynamically tuned to variant aspects of the terrain vital to our continued well-being. Sensory perception binds each individual nervous system into the encompassing ecosystem. Yet as more and more tools have inserted themselves between our bodies and the living land, the collective human nervous system has been progressively decoupled from the wider interplay of biospheric forces. As the spontaneous reciprocity between our senses and the earthly sensuous has been short-circuited by our increasing engagement with our own technologies—as we’ve entered into a closed loop with our own creations—humankind has slipped into a kind of free fall or runaway state, unconstrained by our actual surroundings. Glistening oil and night-black coal have a concentrated charisma very difficult to resist. Fossil fuel powers the manufacture of our digital artifacts; cheap electricity from fossil fuel enables the functioning of those many gadgets, powering the immense webwork of electronic exchange. With our animal senses transfixed by our own, human-generated media—our ears snagged by the words or rhythms churning from our headsets, our visual focus captured by the images steadily dancing across our handheld, desktop, and wall-mounted screens—there’s precious little chance for the wider, more-than-human world to break through our collective trance. And yet it is breaking through, every day, and all around us. However completely we’ve cocooned ourselves within a virtual world of our own making, our animal body still takes its final directives from the larger biosphere—it still needs to breathe, and to drink clean water. It remains susceptible to illness, to creaturely empathy, to the upwelling of earthly wonder. As planetary temperatures rise ever higher, as local weather patterns go haywire, the invisible atmosphere that conjoins our sentience with the sentience of cedar trees, sandhill cranes, and salmon becomes more insistently evident, more palpable, muscling its way back into consciousness. As water sources dry up and disappear, as transportation lines are interrupted by climatic upheavals, as crops fail and infections spread, as economies falter and rolling power outages become commonplace, we look up from our flickering screens, trying to fathom what’s unfolding. And so we find ourselves immersed, once again, in the terrifying beauty of a world that exceeds all our knowing. Is this biosphere our actual Body, the broad metabolism in which our smaller, more transient bodies are entangled? Is not our real intelligence the palpable presence of these leafing forests, of those mountains conjuring clouds out of the fathomless blue, of these tides laced with crude and strewn with bright-colored plastic? Have we yet reached the outer bound of our oblivion? Like the olfactory sensitivity of salmon, like the keen eyes and ears of cranes, our human senses have coevolved with the enfolding Earth, and hence are dynamically tuned to variant aspects of the terrain vital to our continued well-being. THIS DESERT DRIPS SILENCE. I am walking in the Bosque del Apache, along the Rio Grande, in late winter. A few sounds are evident—a mouse skittering through dry leaves, the lapping of breeze-stirred ripples at the edge of this flooded field—yet all within the compass of a silence that radiates from the ground and leaks from the sagebrush and the bare twigs of the cottonwoods clustered on the far side of the water. Whispers of cloud laze in the stillness above the western hills, and a giant sun slides down between those wisps, stopping to rest itself on the skyline, flattening and widening as it does so. The sun seems reluctant to leave this domain, pouring its honeyed gaze upon the clumps of sage and the cottonwood branches, granting a gold sweetness like that of apricots to the huge, implacable quiet. The sun slips its toes behind the hills, then sinks down into the Earth. Two birds—a pair of common mergansers—paddle the near surface of the flooded plain. To my left the cloud wisps are bright pink brushstrokes above the hills. They deepen slowly to magenta as I watch. When I turn back toward the east, a band of dark gray is rising from the horizon: the visible shadow cast by the Earth into its atmosphere. Cool air wafts against my face, a chill coming up from the water. A duck out near the middle is speaking gently, three staccato quacks, then three more. And then I hear this other noise: The faint sound of a screen door with rusty hinges slowly opening off to the north, some old-timer’s cabin. But then another rusty door opens, and then another, and then three and five more—until suddenly it seems a thousand rusty hinges are complaining louder and louder as they approach out of the dusk, becoming visible now as a silhouetted arc of birds, vast, flapping toward me from the north, a wobbly configuration stretching a half mile or more across the sky, getting larger and larger as the crazed, rusty bugling grows in volume. And then I notice another arc darkening behind the first one, and then a series of wobbly lines converging from the northeast, and others from the northwest, as the swelling creaky-hinged crowd of voices begins to vibrate within my chest, an immense and enveloping sky-sound of the most shivering weirdness, a rapid “ah-uh-uh-uh-uh-uh . . . !” echoing from and overlapping through every sector of the air, as thousands upon thousands of sandhill cranes descend upon the flooded field before me, some of them swerving in just above my stunned and upturned face, wingtip feathers splayed, others circling and circling before they land in large sprays of water upon the now cacophonous surface, while other clusters and lines steadily emerge out of the north, the sky itself nothing other than a shifting, breathing fabric of wings and outstretched, bugling necks. Their stuttering cries reverberate in the hidden hollows of my flesh, and I’m carried out of myself by waves of intersecting rhythm, my awareness scattered and radiating across the water into the trees, vibrating off behind me into the clumps of sage and echoing out from my shoulders into the deepening dusk. I am dispersed; without an inside or outside, I am a sheer multiplicity, a crowd, a flock of selves, or cells, echoing one another across the fields—less a body than a fluid medium rippling with interpenetrant rhythms, a locus alternately concentrated and diffused, whirling from the darkening hills to the trees to the tears streaming down my cheeks as I am carried aloft by the cranes. However completely we’ve cocooned ourselves within a virtual world of our own making, our animal body still takes its final directives from the larger biosphere. David Abram is founder and creative director of the Alliance for Wild Ethics. Read the original post of this blog on the excellent Emergence Magazine’s website.